Why is Australia giving away our natural resources for free? By 2021 Australia will eclipse the Persian Gulf state of Qatar to become the world's biggest exporter of liquefied natural gas. In that year, Qatar's government will receive $26.6 billion in royalties from the multinational companies exploiting its offshore gasfields. According to Treasury estimates, Australia will receive just $800 million for the same volume of gas leaving our shores. Take Action: Join the Campaign for a Fair Share of our Natural Resources! Sign up to receive emails about the campaign and how you can support calls for a fair gas tax system. Thank you for joining the Tax Justice Network campaign for a fair petroleum tax! We will be in touch shortly with opportunities for you to be involved. Together we can ensure all Australians benefit from our natural resources. the Tax Justice Network Australia. The PRRT is the primary tax on all oil and gas production. The PRRT is a profit-based tax. It was initially designed to allow oil and gas companies to recover their investment while recognising that these resources belong to the Australian people. The tax rate on profits is 40%. A decade ago the PRRT system worked reasonably well and collected a significant share of the revenues generated. Changes to the PRRT system have expanded loopholes and combined with aggressive tax avoidance, the effectiveness of the PRRT system has been gutted. Generous tax subsidies built into the PRRT allow the oil and gas industry to accumulate billions in tax credits – and the value of these credits compound every year at rates as high as 18%. In 2015, the value of accumulated PRRT tax credits was nearly $190 billion. If the PRRT was working the way it was originally intended, it would generate an additional $480 billion in government revenues over the next two decades. That amount would cover roughly 80% of the current annual national education budget over the next 20 years. This revenue, which could fund our public schools, hospitals and infrastructure, is being lost. Japan – the world’s biggest importer of LNG – is set to collect more tax revenue from Australian gas than Australia will collect in PRRT from all LNG production. Australia is on the verge of being the world’s biggest exporter of LNG. Over the next 4 years Australian will collect zero in PRRT revenue from the five new offshore LNG projects and no direct royalties are paid. Australia is already one of the top five LNG exporters, and set to overtake Qatar as the world's leading LNG exporter by 2021. However, it appears that Australians will miss out on the benefits of the boom, because its royalty regime has failed to keep up with global norms. Multinational fossil fuel companies exploiting liquefied natural gas in Australia have built up a further $50 billion in tax credits over the past financial year, further delaying any meaningful royalty payments from the massive export sector. The Turnbull government must introduce a 10% royalty on all offshore oil and gas projects in Australia to ensure taxpayers start getting a fair return on their natural resources, the Tax Justice Network says. A commonwealth royalty on Australia’s offshore oil and gas fields could generate between $4 billion and $6bn over the next four years, anti-tax avoidance group Tax Justice Network has claimed. But global oil giants Chevron and Shell, the nation’s biggest LNG developer and producer ­respectively, say the nation’s fiscal regime is already challenged, and any move to change the ­Petroleum Resource Rent Tax would be a severe threat to future development. The federal government could reap an extra $6 billion in tax revenue over the four-year budget horizon if liquefied natural gas projects operating in federal waters are brought under a simple royalty scheme that already applies to competing gas projects in Australia. The $1.5 billion-a-year revenue fix has been proposed by the Tax Justice Network in its submission to Treasurer Scott Morrison's review into the petroleum resource rent tax, or PRRT. The Australian Government agreed to an inquiry after shocking analysis revealed that multinational oil companies are extracting and exporting Australia's gas reserves for free. Sky News host Janine Perrett discusses the issue with Fairfax's Heath Aston, who covered the story in depth, and the Tax Justice Network's Jason Ward, who requested the inquiry. As Australia is on the verge of becoming the world's largest exporter of LNG, Australia may not receive any revenue for decades, unless the government makes changes. Former Labor minister and Petroleum Resource Rent Tax architect Craig Emerson backed the government's PRRT review, noting that the original deductions for exploratory activities could be "too generous" and concessions granted by the Howard government in the mid-2000s may have undermined the regime's integrity. How can the government know the Petroleum Resource Rent Tax is being rorted by companies? Easy: The petroleum industry isn't complaining about it. Oil and gas companies are not lobbying to have it changed or removed. It was a dogged group of Tax Justice Network advocates - the same people who launched the corporate tax avoidance research that eventually resulted in the Coalition's diverted profit tax - who saw the scandal in the PRRT. TJN spokesman Mark Zirnsak, strategist Anthony Reed and researcher Jason Ward drilled into frightening numbers that contributed to a series of stories acknowledged by shadow treasurer Chris Bowen on Wednesday as having precipitated political action this week. The Turnbull government has announced a formal review of the petroleum resource rent tax regime, following a rapid decline in revenues from the tax. 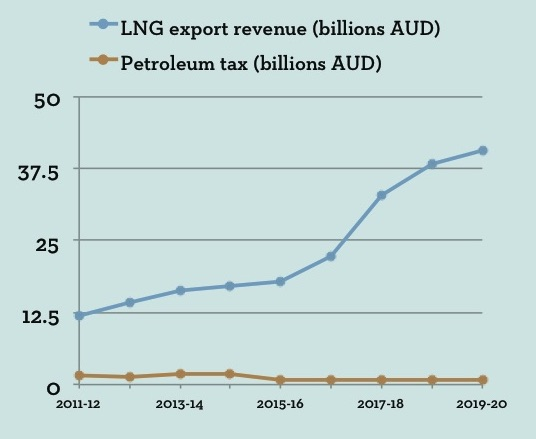 It follows months of disquiet about the effectiveness of the tax and warnings from the Tax Justice Network that Australia is set to blow another resources boom because the tax is failing to collect adequate revenue from the explosion in liquefied natural gas exports. The Federal Government will review Australia's petroleum taxes amid a plunge in oil and gas revenue and a crackdown on multinational tax avoidance. Treasurer Scott Morrison said revenues from oil and gas taxes have plummeted in recent years, and the review would examine why the fall has been so great. Labor and the Greens plan to use a formal parliamentary inquiry to investigate Australia’s royalty regime for oil and gas companies, following a damning report. Labor says it will now push to have the existing corporate tax avoidance inquiry include public hearings into the petroleum resource rent tax (PRRT) and commonwealth royalty regime, to cover royalties paid by the NWS project. The Greens say they want to establish a separate inquiry to focus specifically on the revelations from the ANAO report. AUSTRALIA is at risk of blowing the LNG boom. A recent analysis of International Monetary Fund data released by the International Transport Workers' Federation revealed Australia took the wooden spoon when it came to extracting royalty payments from energy giants.